Your dog’s skin is in constant contact with the world around them and is also intimately affected by diet, parasites, supplements and/or medications. One of the most common things we see in veterinary practice involves skin disease, from simple rashes or injury to infections and/or allergies. It is rare for a dog to go through its life without at least one or two skin issues, and in allergic skin disease, owners and the veterinary team may have to manage the skin condition for the life of the pet. What are the causes, symptoms, and diagnosis of bacterial skin infections? Bacteria and yeast live on your dog’s skin, usually without any ill effects to the pet. However, changes to the skin barrier (scratches, insect bites, self-trauma through scratching or chewing) can allow bacteria or yeast to overgrow. The most common symptoms of skin infection are itchiness (pruritus), rash or pimple-like raised pustules, hair loss (alopecia), and, in some dogs, behavioural changes such as irritability or avoidance of contact, or more attention-seeking to be scratched and handled (to help ease their itch). Diagnosing skin conditions often involves taking samples from the affected skin surfaces (tape sample, swabs, scrapings) and examination of these under a microscope. Also, many skin infections are directly related to sensitivities and allergies to food or environmental allergens. A detailed diet and exposure history are crucial to managing these situations. If an infection does not respond as we hope when treated, skin culture and/or biopsies may be needed. Ringworm infection does not involve a worm at all. Instead, it is a fungal skin disease that can be contracted by direct contact with an infected animal. It can also be from carpet, bedding, or grooming tools that have had contact with an infected animal. People, dogs, and cats (along with various other animals) are at risk. Although most animals that show clinical signs of the disease have some form of immunosuppression, such as with kittens and puppies, the immune system isn’t fully developed when exposed. 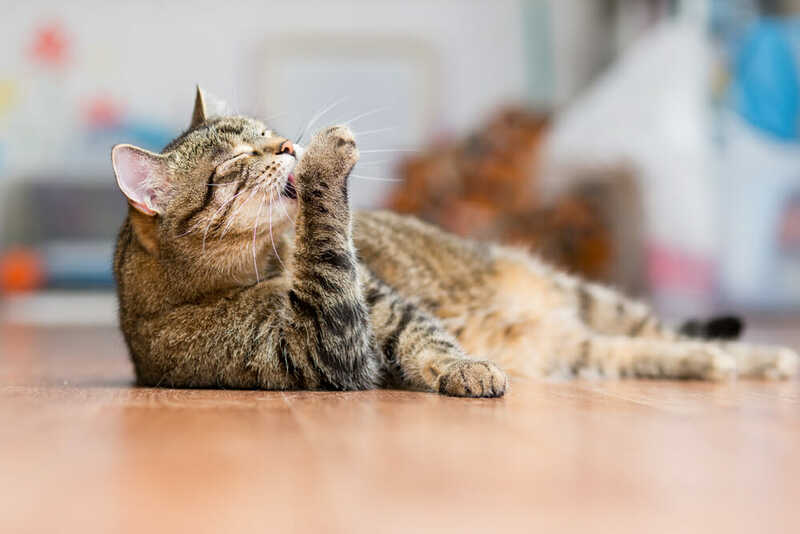 Ringworm is much less common in dogs than in cats, and cats are often exposed in cattery situations (where many cats live together; the fungal spores can live for years under ideal conditions). The most common symptom in pets is localized hair loss sometimes with some dry scale/dandruff or thickening of the associated skin. Treatment for ringworm usually involves topical shampooing, oral medication, and environmental management, although some cases of ringworm are self-limiting; that is, as the animal’s immune system improves/matures, it will sometimes go away without treatment. Allergic skin disease is a very common issue in dogs and cats. There is certainly a genetic component to some allergies, such as atopic dermatitis, but overall the ‘cause’ involves an abnormally overzealous immune response to normal substances. Allergies can involve ingested food particles (especially proteins), external parasites (as with flea allergy dermatitis, where flea saliva causes excruciating itchiness and subsequent self-trauma), bacterial or yeast hypersensitivity (yes, even to the ‘normal’ ones on their skin), and any environmental allergens (dust mites, dust, grass or other plant pollens, etc.). Treatment is based on an individual’s specific clinical presentation; what works for one allergic pet may not work for the next. After superficial, secondary infections are treated, various skin cytology tests, diet trials, and ideally intradermal skin testing, management plans can be prepared with the help of the veterinary team. Treatment involves many aspects (topical bathing or sprays, oral medications, special diets or supplements, and frequent re-examination to stay on top of secondary issues), and is often life long. Allergic skin disease can be very frustrating for pet parents, the veterinary team, and the pet; we try very hard to offer as much support and information as possible to help our clients do the best they can for their pet. The primary skin parasites we see in Eastern Canada are fleas and ticks. Both are endemic (considered ‘here to stay’), and both can cause issues year-round. Treatment and prevention plans are made with the individual pet and family dynamic in mind whether it is an oral tablet, topical, or the frequency of medication monthly versus every 12 weeks. Hormonal, or metabolic, skin diseases are less common, although Cushing’s disease (hyperadrenocorticism), hypothyroidism in dogs, and sometimes hyperthyroidism in cats are often diagnosed. Treatments may involve suppression of certain hormones or supplementation, depending on the disease and any other associated issues. The key to safe and adequate management in these animals is frequent follow up through weigh-ins, physical examination and blood testing, and adjustments are made with the individual pet’s needs in mind.